As mother of two Princes, I feel totally qualified to offer advice on interiors that bridge the sometimes cavernous style gap between mother and son. So imagine my delight when a couple of weeks ago I received a lovely email from a fellow MOS asking for my advice on this very subject. Well, specifically on the subject of bigger boy's rooms, since when they reach double figures they start having their own pesky interior design opinions don't they? And the problem is, they have a nasty habit of being different from ours. I was therefore prompted to write a quick blog post to cover off everything I've learnt so far in my parenting/decorating journey. My aim is to give all my MOS sisters out there a quick reference guide for when they're dragging a reluctant tween or teenager round Ikea and could really do with keeping moaning down to a minimum. The good news is, the clutter that comes with little boys reduces in adverse proportion to their height. The bad news is, the clutter gets uglier and smellier. Lockers Image from Aundraskinner Interiors. I like the industrial look for boy's rooms. Nothing too shiny or too white because it's guaranteed not to stay that way for very long. Danny Zuko may be to blame, but for me American high school style lockers are the perfect way to trick your son into keeping his school books tidy. 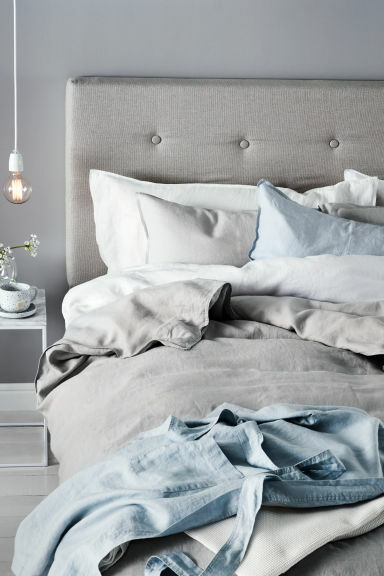 This full height set from Maison Du Monde is perfect. I'm not sure boys ever grow out of their love of trophies do they? It's therefore worth investing in some cool shelves to put them on. Trophies are dust gatherers, for sure. They are also a b***ard when you accidentally knock one over and it falls on your big toe. My advice (if you can't keep them out of sight), is to keep them way out of reach on rustic style shelves. I haven't personally tried this old crate/shelf solution, but if I were a more able DIY-er, I totally would. I have a problem with flat pack furniture. No matter how well it's put together the force with which my boys pull on handles (no pun intended) means that the front of the drawer will eventually come off. That's why I'd much rather buy an old, solid set of vintage drawers than a cheap modern flat pack kit. That said, sometimes, old drawers can be hassle too. The drawers need to run smoothly otherwise they will forever be hanging out. They also need to be a modern size and shape to fit with most bedrooms and sometimes, to get exactly what you want, you have to splash the cash. I love Loaf's bedroom furniture for it's combo of vintage style and practicality that both mother and son can get on board with. 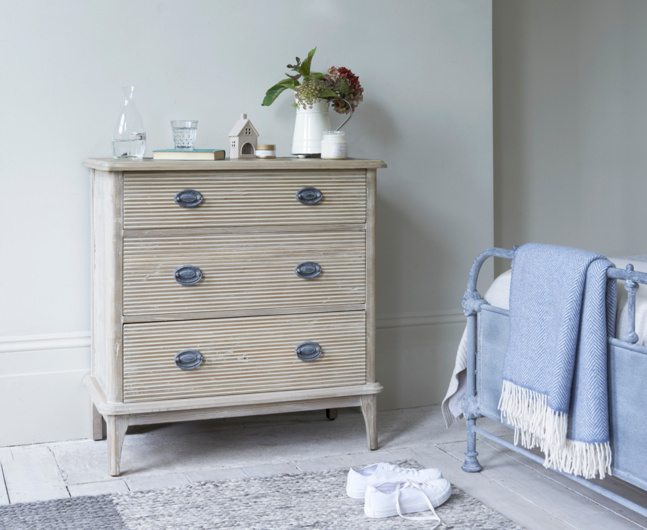 This is the Lumber drawer unit which I teamed with Loaf's Lourdes wardrobe in my son George's room for a more relaxed, less super-styled look which suits him perfectly. Their hot dogs do nothing for me, but I have yet to leave Ikea without that sense of fulfilment that comes with loading one of their many storage boxes into my boot. These zipp-able, boxes on wheels are perfect for the mates' sleepover bedding, spare shoes, winter woolies etc that can be kept nicely out of sight, through closed season. A decent desk and chair is a must for a teen room. I picked up a vintage leather swivel chair for £8 at my first every auction and I still can't believe my luck. I teamed it with the cheapest (and chicest) white Ikea trestle, proving that you don't have to spend a fortune to get a hip, eclectic vibe going on. 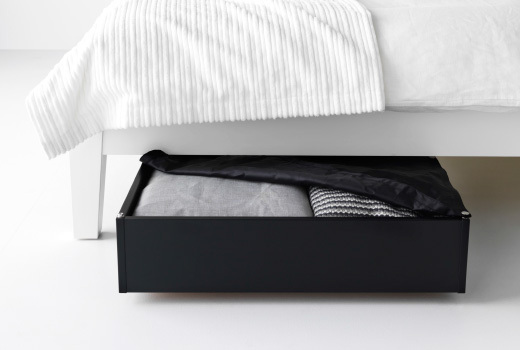 When it comes to bedding, go plain, go non-iron, go frequent wash friendly. I've got a grey cotton jersey set in both boy's rooms and they absolutely love it for the comfort factor, although I do get concerned about the sweat situation in summer. Another look I love and one which works brilliantly well in older boy's rooms is washed linen. Don't try ironing it, that dishelved look is what we're aiming for here - and in fact what we're likely to be embracing for the forseeable future. A couple of cushions is still a nice way to dress the beds and here's a nice idea to make them personal to the child. b) You can be sure your husband never, EVER wears a St George cross football jumper again. No, I haven't quite run out of S words, in fact this final one is probably the most important on my lad's room check list. You see, Shizz (cap S) is what gives a room individuality and as our kids grow up with intense social media pressure to look and act a certain way, it's the MOS duty to totally celebrate their individuality. It was a special moment three weeks ago when my son came to me with his birthday money and a screen shot of an art print he'd sourced on Etsy. Whatever he'd have gone for, I would have tried to embrace, in the hope that his involvement with creating his personal space might eventually encourage him to keep it tidy. * Anyway, the fact that George chose a cartoon style image of the Gallagher brothers in their 90s heydey, well let's just say I may have shed a proud tear or two. If you've seen my Instagram feed recently you'll know that I've also treated myself to an Oasis inspired artwork, this super cool Patti Robbin's Don't Look back in Anger print. What was once the theme tune to my student days, has since became the antidote anthem to the Manchester terror attack and 100% sales of this print, available from www.nickiekelly.com goes to support the victims. It's therefore the most supersonic artwork money can buy and - I'm biting my tongue but I just can't stop it - your son's love for you will surely Live Forever if you click here to order yours. Sorry Liam, I'm cooler than that, honest. George's collection of baseball caps, most of which he doesn't wear but can't possibly part with causes me beef. But hey, I've decided to roll with it (really?) and have installed a long row of hooks for him to display them on, similar to the one below which is shown alongside another brilliant storage/artform solution for trainers. Of course your son/s will have their own particular Shizz and thinking of a tasteful way to control it, let alone a solution beginning with the letter S may be sending your stress levels soaring. If that's the case, drop me a line and I'll do my best to help. See, we may be neurotic and slightly aggressive, in a don't-mess-with-my-cubs kind of way, but we MOS sisters understand one another, right? That's why I'm totally here for you, to lend a compassionate ear and a supersized bottle of Fabreeze.